The ENC-660SL Endurocycle - is a Commercial Training Bike with a 5-star design crank and is constructed of a heavy duty 2 x 4 steel frame. It features a 66 lb. solid steel flywheel for super smooth riding. It has a belt driven mechanism for a smooth and quiet workout as well as a five star design crank for extra endurance. This is the top of the line in indoor exercise bikes. Multisports Cardiovascular Equipment is made with only high quality components to create smooth, quiet, and durable exercise machines. Heat treated components, sealed self-lubricating bearings, and high density foam upholstery provide smooth motion, long lasting comfort and durability. 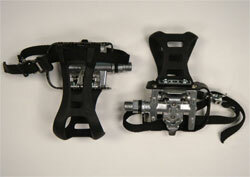 This pedal system provides the choice of using a traditional athletic shoe or a SPD shoe cleat. Snap in toe clip for use with traditional athletic shoe. Also has locking feature to prevent accidental release. High performance cro-moly spindle and industrial grade bearings provide years of trouble free use. Need to make a large purchase of indoor cycling bikes for a hotel fitness room or commercial gym? Contact an Ironcompany.com strength equipment specialist today at 1-888-758-7527 or email quotes@ironcompany.com.